For those seeking massage or osteopath treatments in the Doxford Park area, Vitaphysical is just a short trip away. From our base on John Street, approximately ten minutes’drive from Doxford Park, we treat an array of ailments and conditions, providing relief from pain and promoting relaxation. Founders Jason, Vitaphysical’s osteopath, and Bronyia, a massage therapist, opened Vitaphysical in 2007. The business was originally known as the Sunderland Back Pain Centre, but as the team and service offering expanded, the name changed to reflect the comprehensive range of conditions treated. We still hold our back pain clinic for patients from Doxford and beyond and also offer sessions for other chronic problems such as neck pain and shoulder freeze. Visit the what we treat page for details of the many conditions our musculoskeletal practitioners combat. If you can’t see your own issue listed, please get in touch for a chat with Jason our osteopath. This will help us match you with the best possible treatment. Some of our patients come to us after accident or injury, while others arrive at Vitaphysical following limited success with physiotherapy programmes or after visits to a chiropractor. We’re exceptionally proud of the high level of satisfaction among our patients, which is why we offer a 100 % money back guarantee on all courses of treatment. You’ll also find a number of patient success stories on this site. We prioritise relaxation as well as physical recovery and offer a huge range of massage therapy treatments. Massage therapists Bronyia, Kirsty and Emma deliver traditional full body massage, deep tissue massage and soothing relaxation massage, as well as sports massage and pregnancy massage. 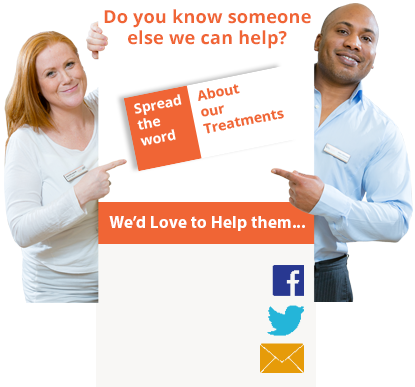 You’ll find our treatment centre on Johns Street, Sunderland, just a short distance from the city’s train station. Free patient parking is offered on site. Book an appointment with us using our online booking form or email info@vitaphysical.co.uk or call 0191 565 8886 to discuss your requirements further. Don’t forget to download your discount voucher, redeemable against your first visit.